Leeds has a beautiful 9-hole course located just southwest of town. 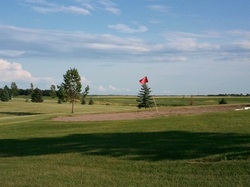 It is one of the few remaining sand green courses in the state of North Dakota. If you have never played sand greens, come on out and give it a shot! The course is a challenging, par 34 that requires you to use every club in your bag. Green fees are $3 for nine holes or $5 to golf all day. Women's night is every Wednesday and Men's night every Thursday with meals served both nights. Couples/Family nights are held on various dates. Tournaments are held throughout the summer. The clubhouse is available to rent for both members and nonmembers for any occasion. The clubhouse is air-conditioned and has modern restrooms, a remodeled kitchen, and seating for 50 or more people. 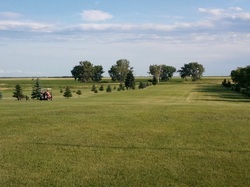 The large patio area has a nice view overlooking the course and adjacent farmland. Contact any board member for more information or to reserve a date.